Cards: ProSet 1991 Helmet Card, Proset World League 1991, ProSet 1991. My father and I started going to WLAF games in the summer of 1992 down in San Marcos, Texas at Bobcat Stadium on the campus of what was SWT at the time. 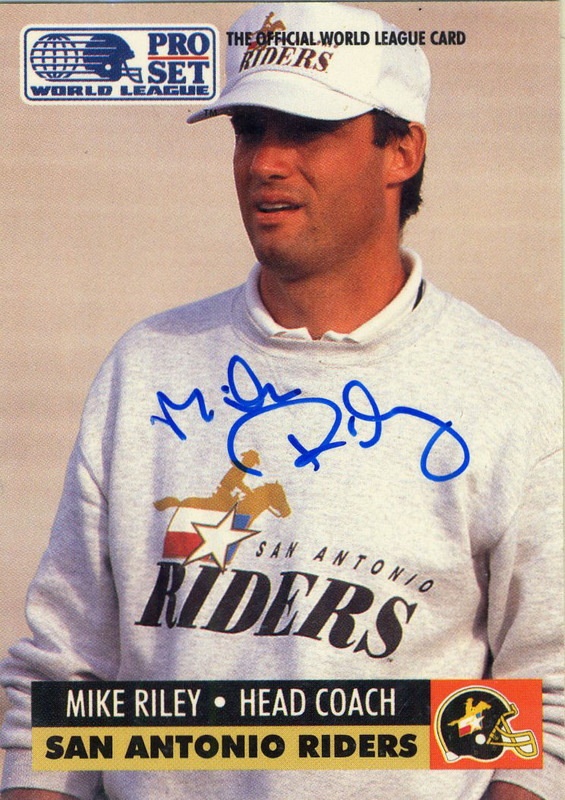 The team had played its games the previous season in San Antonio at the dilapidated Alamo stadium (home of the Gunslingers of the USFL), but in 1992 planned to move into the Alamodome. The Alamodome was running behind schedule and that and a combination of a disagreement on sales of alcohol prompted the team to move to a reasonable distance from Austin. The WLAF had a one game scrimmage/ preseason for each team, and the Riders drew the Ohio Glory who they beat soundly that day. Coach Riley preferred sound defense and a strong running game. A former Alabama CB and Bear Bryant apostle, Mike Riley and I talked for a few minutes after the game about coaching. He was very nice and stopped to take a photo or two with me. Riley isn’t exactly a journeyman coach, but it’s easy to see him as such since he rarely has spent more than 3 years at any college. 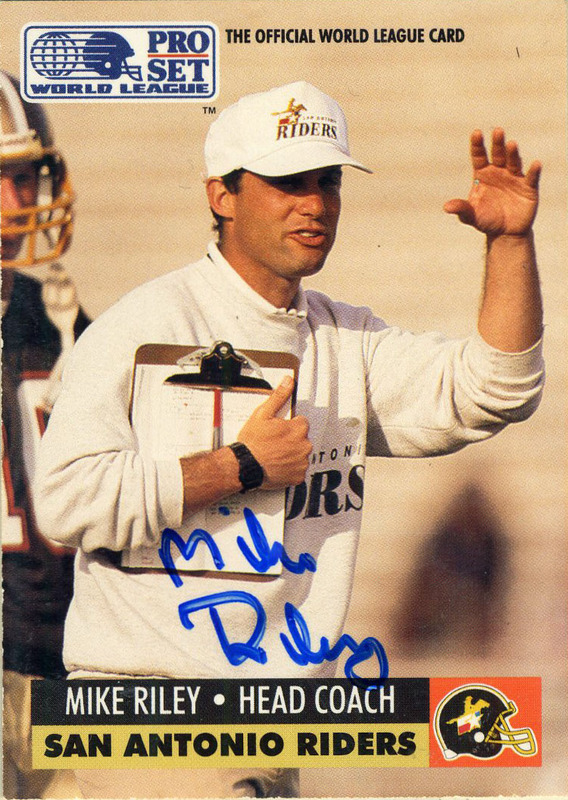 Winning two CFL World Cups for the Blue Bombers, Riley made the jump to the WLAF in 1991 where he coached the Riders to a 4-6 record and a 7-3 record in 1992. (The team was denied the playoffs by tiebreakers.) 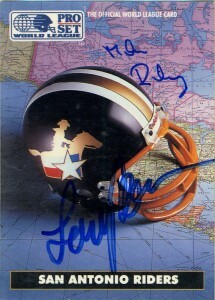 After the team folded he was hired by Larry Benson (owner of the Riders and signer on the helmet card with Riley) to coach the expansion San Antonio Texans of the CFL, but that team did not get off the ground and folded quickly. 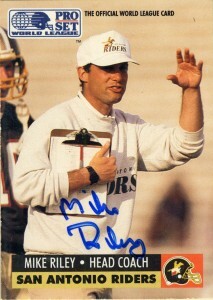 Riley then went on to coach at USC under John Robinson as quarterbacks coach and offensive coordinator, before he was hired by the Oregon State Beavers in 1997, whom he laid the foundations of success for. 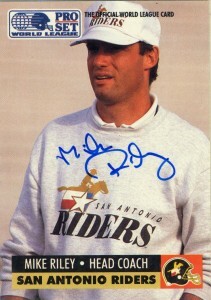 In 1999, though Riley was hired to coach the San Diego Chargers where he had a rocky tenure and was released after two seasons. Riley proved though you could indeed return ‘home’ as he was rehired by Oregon State in 2003 where he has remained since posting 5 bowl wins and a .576 winning percentage in 9 seasons.